Milk (if requried) 1/2 cup. In a large bowl add maida, baking powder, sugar, cocoa powder, ghee, eggs, grinded almonds and mix well. If required add small amount of milk. After mixing all ingridients set this mixture on the side for 10-15 minutes. Pre heat oven on 250 degrees, 10 minutes before. Make biscuits with the help of biscuit cutter and put them in the oven on 250 degrees. 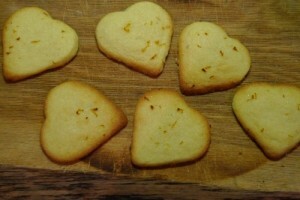 Bake biscuits for 20 to 25 minutes or when it become light golden. Always bake biscuits on low heat.